The Lal Kitab is a great work of our times written by one who happened to live amongst us. It is a treatise on astro palmistry with astrological remedies. In other works on palmistry we find names of lines, mounts and marks etc after the names of planets and there ends their astrology. 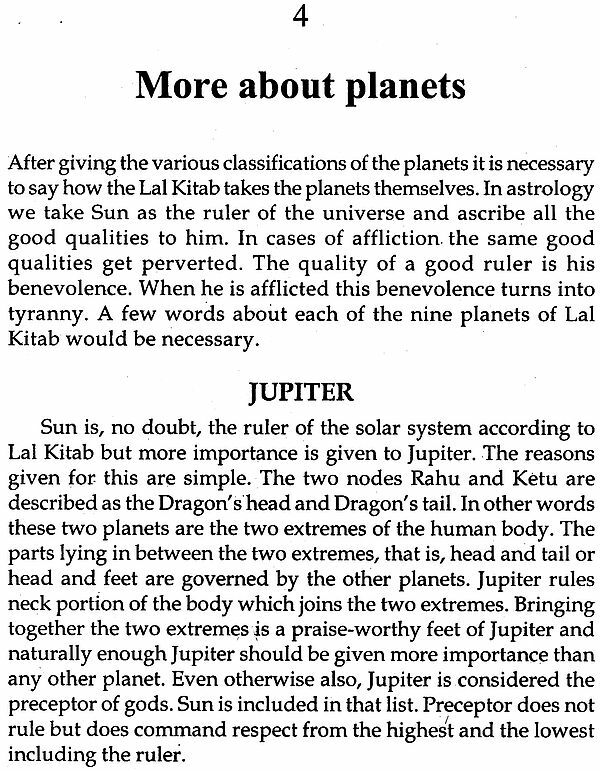 Lal Kitab after naming the mounts etc after names of planets goes much further. Palmistry is explained in astrological terms. This work would have attained the status of a great classic but for its script, which is Persian and which, finds very few students today. I have tried to remove this handicap by stating in English what has been written in Urdu. The original text in Urdu was studied and copious notes were taken. This work is based on those notes. The Lal Kitab is astro-palmistry. 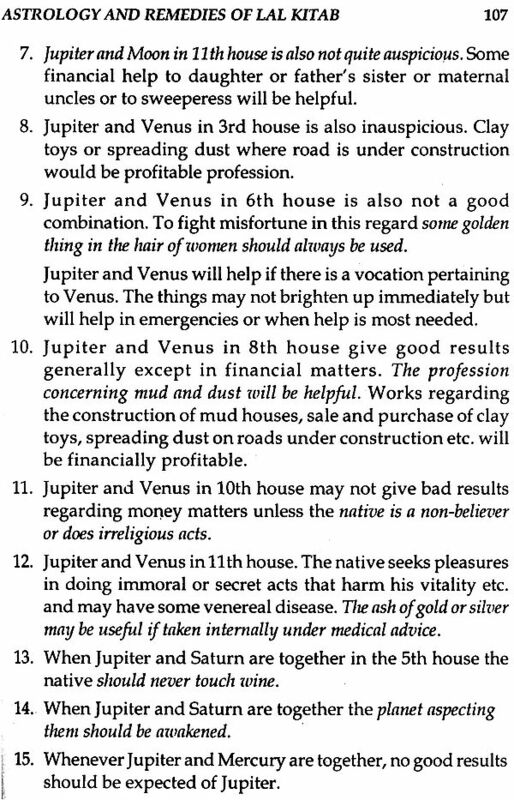 In the present book I have tried to restrict myself to its astrological part. It may be stated at the outset that some of the astrological concepts and assumptions are quite new to the current astrological thought. A brief reference to them has been made in the opening part of the Book under the heading introduction. This with a view to inform the reader that the astrology provided in the book is not identical with the astrology we know. 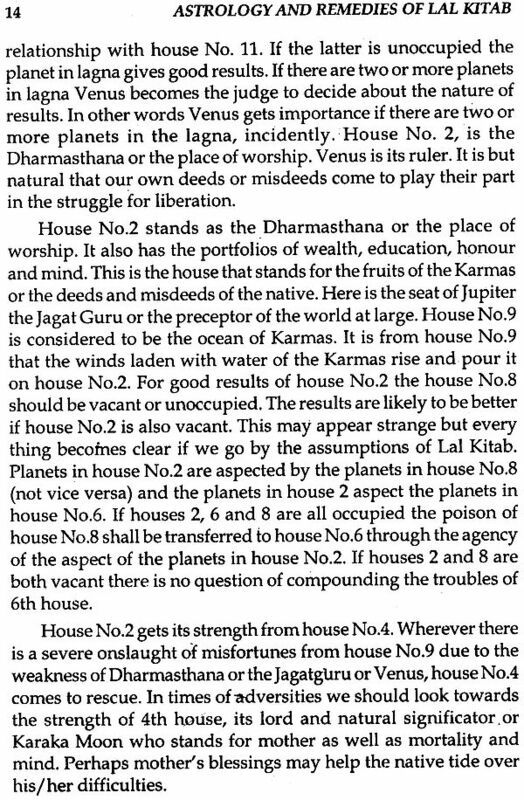 In the second chapter Twelve Houses of the Horoscope the nomenclature of the houses as found in the book has been given. 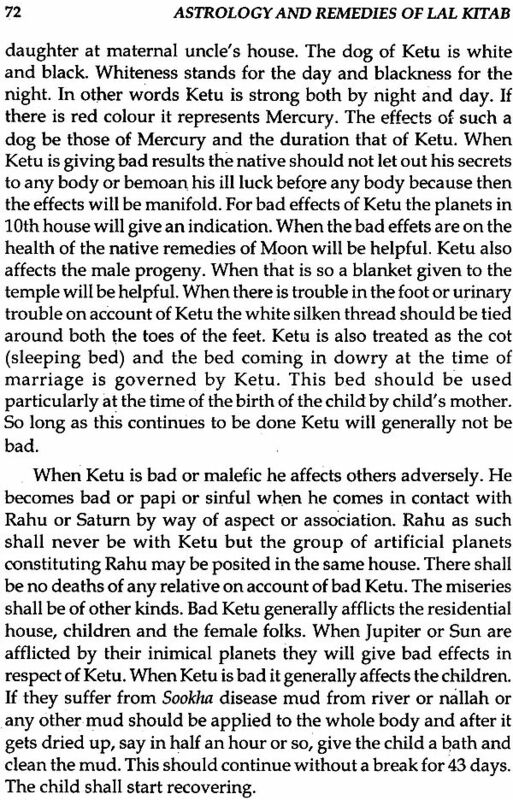 How different planets behave in different houses has also been discussed in the chapter. There is the question of aspects, which has been dealt with at proper place. There is however some secret relationship or mutual understanding between the planets, which is called the Yoga drishti of planets in the Lal Kitab. 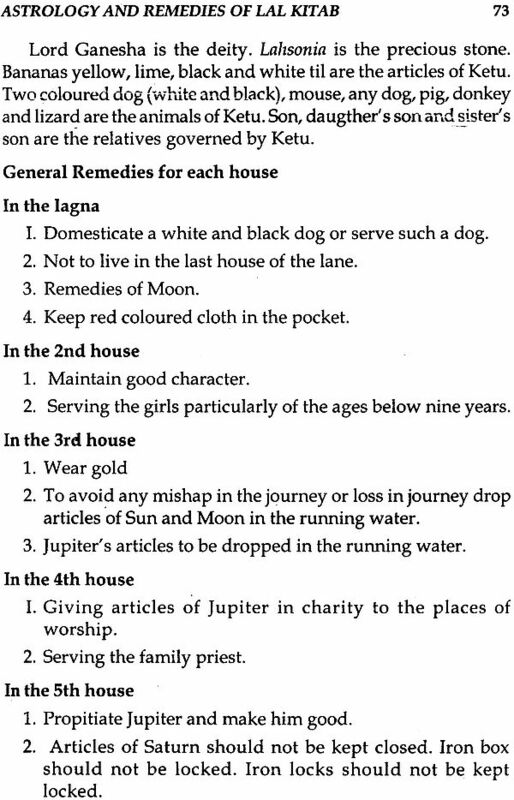 This aspect has also been discussed in the same chapter under a sun heading more about the houses. Here I have also given the commodities etc governed by the houses. 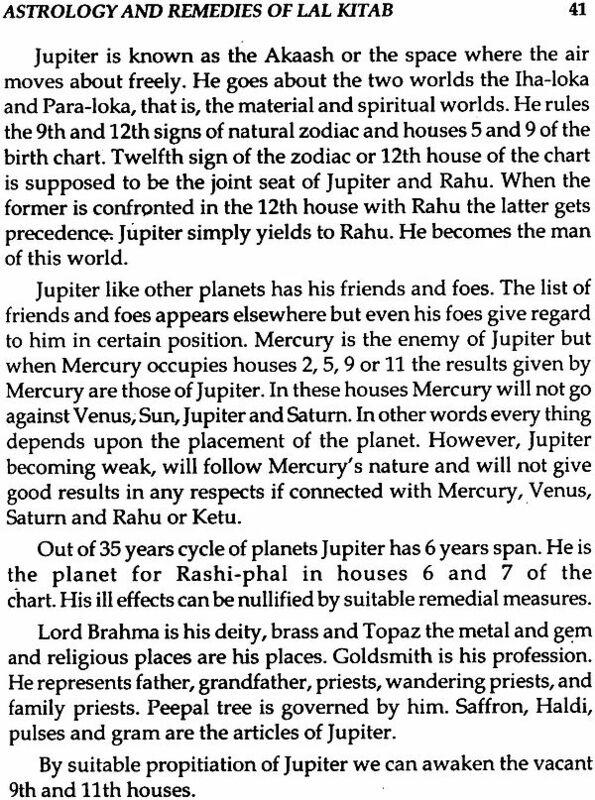 In the 3rd chapter The Planets some preliminary information is given about the planets in general like their classifications etc. New concepts of matching planets, equivalent planets and comrade planets have also been given here. The things relating to planets and combination of planets have also been given here. The 3rd Chapter is a discussion about the planets in general. This is again slightly different from the current thought in some respects. The information regarding the nature and classification of planets provides and interesting reading. Some general discussion is there about planetary aspects, Yoga drishti of planets, their affliction in certain houses and the articles and relatives signified by the planets. Besides this there is a discussion about each individual planet in each house and remedies suggested for his bad effects in various houses. This portion has been marked as chapter 4. In the 4th Chapter "More about the planets" there is a brief discussion about each individual planet and suitable remedies for its bad results in each house. 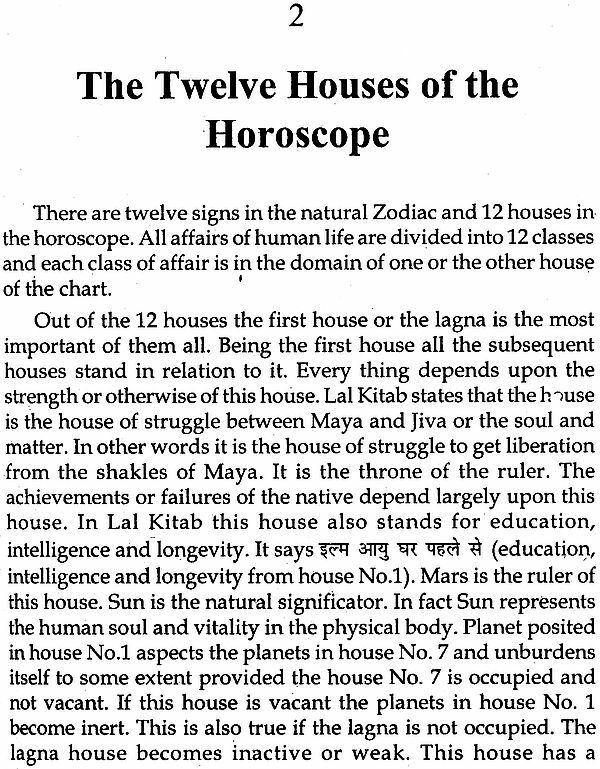 The Lal Kitab has divided the human brain in 42 divisions and these divisions are associated with the houses of the horoscope. This aspect has been dealt with in chapter 5. This is perhaps the most important part in as much as it equips us with handling the problem child and understanding the real man/woman/child in the native. The 6th chapter throws light on an important aspect of human life. This is the Rina Pitri or the parental curse. How to identify the person who has cursed the native and his family and suitable remedies to ward off the curses pertaining to various houses have also been given. The 7th chapter provides information regarding sicknesses and diseases which have not only become common these days but also too complicated to be easily identified. In fact there is need to provide more such subjects but the same could not be done because of the paucity of space. Evil of the curse has been given. I have discussed in brief how the chart should be examined in the cases of sickness and the illnesses signified by the planets. Chapter 8 deals with the precautions required of handling day-to-day problems like going to new residential premises, selection of brides or bridegrooms etc. 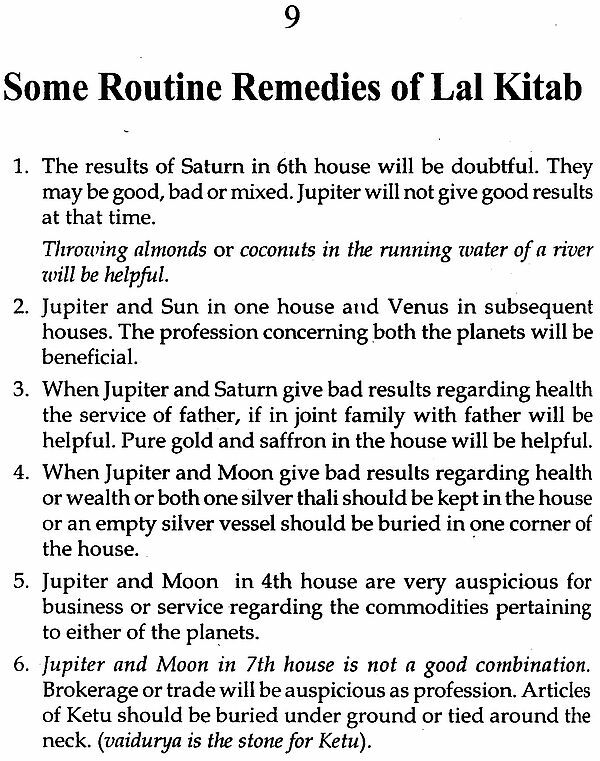 Chapter 9 lists with the various remedial measures of Lal Kitab for various planetary ills. In fact this is the most important part of Lal Kitab as the book has drawn admirers on account of thee remedial measures. Here the book virtually ends but to make the book easier I have added some hints for prediction which may be found useful by the readers in putting their theoretical knowledge to practical application. This has been done under chapter 10. In the last chapter called the Critical Appreciation the author has taken liberty to express his views on the book and its astrological philosophy. 12 Glossary of Hindi Terms.